While tucked away virtuously in bed at his farmhouse one winter night, according to a hair-raising story from 1879, an old man in the Wabash Valley was literally blown to pieces by a cascading meteorite. 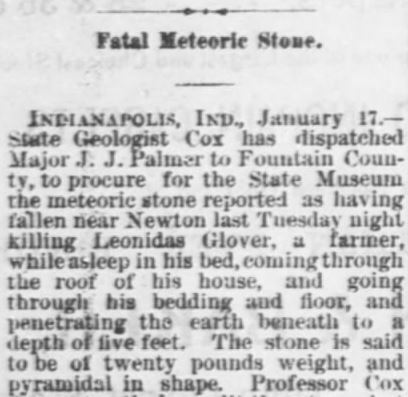 It was in January 1879 that a special telegraphic dispatch came to the Indianapolis Journal describing the fall of a meteorite near Attica, Fountain County, a large stone of unknown composition that, whirling through space, came crashing through the roof of the farmhouse of Leonidas Glover, a widower, who lived alone. The meteorite [struck Glover], who was in bed, supposedly asleep, and horribly mutilating him, continued its course and buried itself in the earth beneath the house. Of course the lonely widower was instantly killed, and when the neighbors the following morning discovered the remains, there was great excitement, all of which was given in harrowing detail in the dispatch. Due to the juiciness of the 1879 storyteller’s technique, let’s look at the original tale itself. 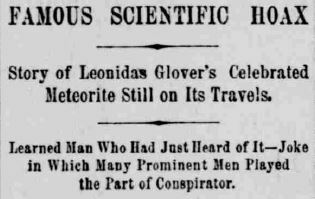 The killer Fountain County meteorite made the rounds of many American newspapers, going viral in those early days of syndication. A “Covington special” to the Indianapolis Journal relayed the original claim, but here’s a version as it appeared in the Tiffin Tribune of Tiffin, Ohio, on January 30, 1879. Covington, Ind., Jan. 15. On Tuesday night last, Leonidas Grover, who resided in the vicinity of Newtown, Fountain county, met his death in a way that is probably without parallel in this or any other country. Mr. Grover was a widower living on his farm with a married daughter and her husband. On the evening referred to, the married couple had been absent on a visit to some neighbors, and upon returning at a late hour, entered the house, finding everything, to all appearances, in usual order, and supposing that Mr. Grover had already retired, went to bed themselves. Next morning the daughter arose, and having prepared breakfast, went to the adjoining room to call her father, and was horrified to find him lying upon his shattered bed, a mutilated corpse. 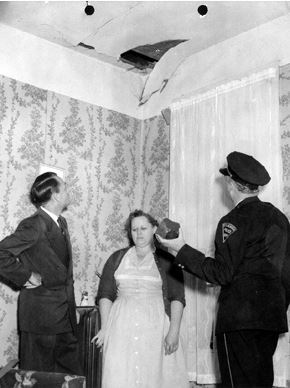 Her screams brought the husband quickly to the bedroom and an inspection disclosed a ragged opening in the roof, directly over the breast of the unfortunate man, which was torn through as if by a cannon-shot, and extending downward through the bedding and floor: other holes showing the direction taken by the deadly missile. 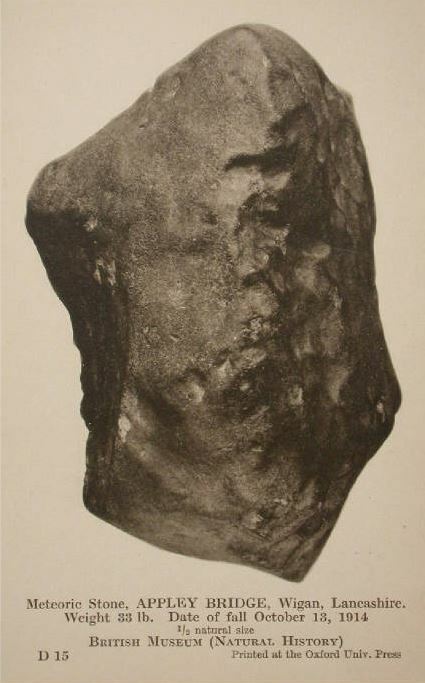 Subsequent search revealed the fact that the awful calamity was caused by the fall of a meteoric stone, and the stone itself pyramidal in shape and weighing twenty-two pounds and a few ounces, avoirdupois, and stained with blood, was unearthed from a depth of nearly five feet, thus showing the fearful impetus with which it struck the dwelling. The position of the corpse, with other surroundings, when found showed that the victim was asleep when stricken and that death, to him, was painless. Despite the blatant tragedy of the scene, Hoosier scientists, especially geologists and sky-watchers, were enthralled and pounced on the report from Covington. But in 1891, the Indianapolis Journal had to tell the story all over again. The State Geologists in question here are Edward Travers Cox (1821-1907) and John Collett (1828-1899). Cox, who was educated in the communal school at New Harmony in his youth, was especially eager to verify the tale. (And with a name like “E.T.,” you’d expect him to be interested in things falling out of the sky) Collett, who grew up in the Wabash Valley and “probably [knew] more about Indiana than anybody within her borders,” was also extremely curious. The news stirred all the local scientists, and the State Geologist, Professor Cox, at once took measures to secure the meteorite. Maj. J.J. Palmer was dispatched to Fountain County with instructions to buy the stone, no matter what it might cost. Meantime the State Geologist was overwhelmed with letters inquiring about the meteorite and asking for all information possible regarding it. The State Geologist wrote an exhaustive article on meteorites, leaving a hole in which to place the heavenly bowlder when Major Palmer should return with it. Professor J. Lawrence Smith was greatly interested in the matter, and it was understood that he was willing to give $500 for it. 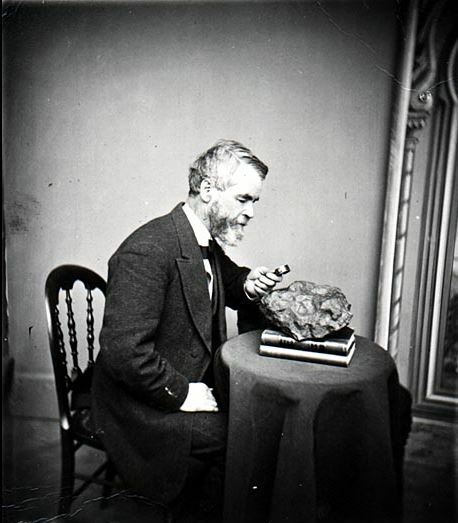 Though I haven’t seen a picture of Cox or Collett examining a meteorite, here’s an image of the great Wisconsin geologist, Increase Lapham, looking at a 33-pound aerolite found in Washington County, Wisconsin, in 1871. 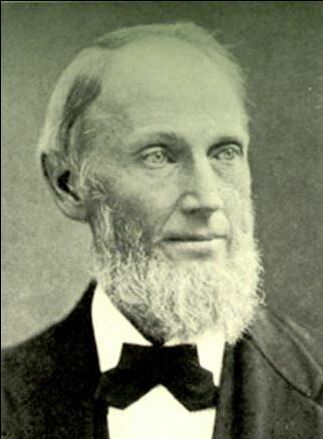 Lapham was one of the founders of science in the Badger State. Were E.T. Cox and John Collett aware of earlier claims about celestial debris causing human fatalities? Before brushing all this off as hare-brained folklore, there were plenty of such stories. A more recent story about a meteorite strike comes from the American South, where stars really did fall on Alabama. 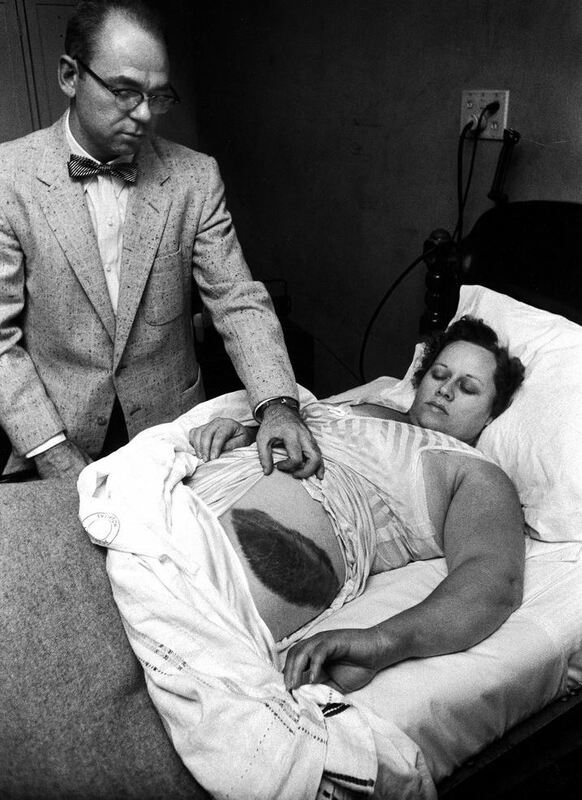 On November 30, 1954, Ann E. Hodges was napping on the couch when she thought a gas heater exploded in her house, then saw a grapefruit-sized rock on the floor, a busted radio, and a bad mark on her hip. Her neighbors reported a fireball and thought an airplane had crashed. The eight-pound rock that careened into her living room in Sylacauga, Alabama, was later examined by Air Force Intelligence and confirmed as a meteorite. Hodges was profiled in Life Magazine that year. According to the Decatur (Tenn.) Daily News, a lawyer from Indianapolis purchased the “Hodges Meteorite” and sold it to the Smithsonian in Washington, D.C., where it still resides, the only space rock ever confirmed to have hit a human. E.T. Cox and John Collett would have been thrilled to have something like the Hodges Meteorite housed at the Indiana State Museum. Unfortunately, as far as anyone can tell, the whole Fountain County tragedy was a big hoax and Indiana’s best scientists were put on a wild-goose chase. When [Major Palmer] returned [to Indianapolis] he reported that he could find no one in Fountain County who knew Leonidas Glover, widower; there was no demolished roof, no desolated household, no hole in the ground. A demand went up from the scientific world for the impious wretch or wretches who had hoaxed them. But the practical jokers took council of their fears and kept quiet until the storm of scientific wrath had passed by. It then leaked out that the hoaxers were two young men of Crawfordsville, one of them a newspaper man. It may be said that one of these, the newspaper man, was sufficiently punished for his connection with the affair. He lost caste in his profession, and it took him several years to regain the confidence he had lost as an honest chronicler of the news. Indiana State Geologist E.T. Cox was duped by a fake extraterrestrial killer. 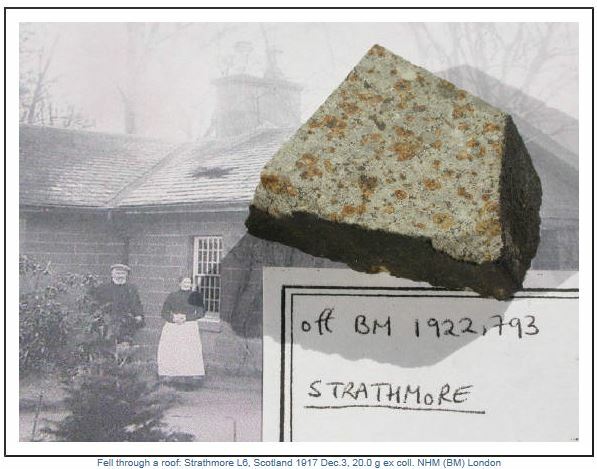 [Palmer] secured a cobble-stone of appropriate size and colored it with black and red ink [to simulate blood]; also a rustic photograph which served for a portrait of the mythical Grover; and prepared plans of the non-existent house showing the course of the imaginary aerolite; all of which he put on exhibition in Joe Perry’s drugstore, then at the northwest corner of Pennsylvania and Washington streets, where they were viewed by wondering hundreds. Perhaps the most notable result was that the story was reproduced by Alexander Winchell, the noted geologist, in one of his scientific works. Chris Woodyard doesn’t know the whereabouts of Palmer’s fake stone, and neither do I. But George C. Harding, editor of the Indianapolis Journal in 1879, probably wanted to know more about the location of the man who gave him the false news to begin with. We take it back in its totality. The death was not a phenomenal one. The aerolite did not come hurtling from the infinite depths of space. It did not tear a ragged opening through the roof of Mr. Grover’s house, nor did it crash through his breast. * * * He didn’t die. He didn’t get hurt. He didn’t even get frightened. He wasn’t there; he isn’t anywhere now, durn him! If Mr. Leonidas Grover ever should come into existence and get killed by an aerolite he will have to get someone else to write his obituary. . . We have precious little faith in thunderstones, anyhow. The audacious villain who invented the canard is an unmeasured fraud and an infinite liar. Hell gapes for him. The devil beckons to him with his hands and horns and tail. Eternal cremation with a brimstone accompaniment is his doom.